This beautifully written book will definitely be on my list of top 10 books of 2017. I absolutely loved it - the characters, the plot and most of all the beautiful writing. I feel like I know these people and miss them now that the novel is done. Amazon affiliate links are used on this site. A copy of the book was won at Goodreads. The novel is set in 1970 and is about the Flynn family - mom, dad, 2 boys and 3 girls. When they were growing up Billy and his sister Nell were always close and spent a lot of time together. Now Billy is coming home wounded in a helicopter crash in Vietnam. He has scars that can be seen but the internal pain is just as bad and more difficult to heal. He returns to his family home to try to recover by being in his familiar place with his family and especially his sister but as much as they try to help him, the more he pushes them away. Billy searches for his normal life but because of the changes in him and in the county, there is only a new normal and he can't learn to live in it. This is a world of distrust of the government over a useless war and seeing it all played out every night on the evening news. Not only is the country divided but families face huge chasms in the understanding between generations. 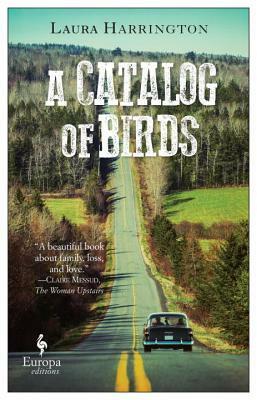 A Catalog of Birds is a novel about love within a family and forgiveness of those we love. Laura Harrington does a fantastic job of painting a picture of what was going on in America in the early 70s - the war protests on campuses, the questioning of the government leadership by most people and the soldiers coming back with wounds both seen and unseen as they struggled to go back to living their lives like they did before their time in Vietnam. I loved this novel and highly recommend it.